BY CHRIS GOSIER ON APRIL 27, 2016 INSIDE FORDHAM, UNIVERSITY NEWS. In a rural part of Eastern Uganda, where both technology and technical expertise are sparse, a community is fashioning a new economic resource out of the earth underfoot—thanks to an international collaboration involving Fordham students and alumni supporters.The resource is an artificial pond for raising fish, and it’s the inaugural project of Fordham’s chapter of Engineers Without Borders(EWB), founded three years ago. A team of students returned last month from the project site, where locals were abuzz with the possibilities for a better life that the fish farm represented. 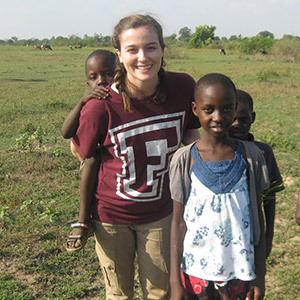 She and three other Fordham students—engineering physics majors all—went to Uganda from March 17 to March 28. Accompanied by a professional engineer who’s a chapter mentor, they oversaw the implementation of designs for the pond that they’d drawn up in the past year. Designing the pond was just one facet of the project. Students also consulted with a student team from the Gabelli School of Business about funding it; presented the project to potential donors and to the national organization ofEngineers Without Borders; and coordinated via telephone and e-mail with those in Uganda who would be doing the digging and building. Along the way, they’ve learned a lot about applying their academic lessons outside the classroom, said physics professor Stephen Holler, PhD, a mentor for the Fordham EWB chapter. “They’ve done a phenomenal amount of work in a very short time,” he said. The project originated in efforts by a Ugandan nongovernmental organization, the Serere Local Fish Farming Initiative, to promote fish farming for economic development in impoverished areas of eastern Uganda. The group submitted its proposed projects to Engineers Without Borders so that EWB chapters could apply to take them on. The Fordham chapter picked up the project because it seemed relatively feasible—compared with, say, building a bridge or a dam—and because the community’s description of its needs and goals was appealing, members said. A team of five students visited the region in the winter of 2014 to assess a few dozen fish farming sites and choose one that seemed the most viable. For the first project, they settled on Omorio Village, where a group of 20 families wanted to build a pond that would generate income to provide for their widows and orphans. The chapter also agreed to see four more pond projects through to completion in the years ahead. The first trip and a portion of the return trip were funded by John Reddy, FCRH ’76, and his wife, Christa Reddy, in consultation with their daughter, Kathryn Reddy, a 2014 Fordham graduate who studied physics. In addition to helping the Ugandan families, the Reddys saw a chance to expand opportunities in the engineering physics program and advance the Fordham mission of educating men and women for others, John Reddy said. “What it came down to was, we believed that this was a great opportunity for the University and for the families that would be benefited by this,” he said. The return trip was funded by multiple alumni donors–including the Reddys–in response to a challenge gift from George McCartney, FCRH ’68, and his wife, Mary Jane McCartney, TMC ’69, who learned about the project at a meeting of the Fordham University Science Council, an alumni group. “They hit a home run with us at that meeting, because they described the project that they did in Uganda and we were fired up to help them make it a reality,” Mary Jane McCartney said. Their presentation to the Engineers Without Borders national organization—which needed to approve the project—was similarly impressive, said Holler, who said he listened to the presentation via telephone. “They had answers for practically everything that was asked of them,” he said. The donors’ money paid for tools and for materials like piping, bricks, and stone. It also paid for laborers’ wages and food, and for hiring someone to drive, translate, and provide security. Grants obtained through EWB paid for the students’ flights and for materials used in digging and excavating the pond. The workers in Uganda started excavating the pond in January, said Fordham College at Rose Hill senior John Murray, the project lead who spearheaded the design work with input from other chapter members and the chapter’s professional mentors. The pond will serve as a model for others in the district who want to build one. The community members had experience with this kind of project; the Fordham team showed them some enhancements, like techniques for fully draining the pond between harvest cycles, Murray said. The pond is stocked with tilapia because they’re relatively easy to take care of, compared to catfish, which would be the other option, he said. The students found it was enriching to interact with the Ugandans and learn about their culture and way of living. They said the Ugandans marveled at various aspects of American life, like the sunscreen the students were donning—“‘We thought you were putting it on for energy,’” said one of them, according to Bolan. Bolan said she was impressed with how readily the Fordham community rallied to make the trip happen—from the administrators who went out of their way to help to the donors who funded the trip.